Managing your music is supposed to be easier in iTunes, but readers have lots of questions. Managing your music is supposed to be easier in iTunes, but readers have lots of questions about this. In this installment of Ask the iTunes Guy, I help a reader create a Genius playlist based on a song in iTunes 12.3. I also take a look at how Apple uses Various Artists for artists in a compilation. And then I take a look at two questions relating to ripping (or not ripping) CDs. Q: In iTunes 12.1 and 12.2, you could create a Genius playlist by selecting a seed song, then clicking the three-dot icon next to the song name. There was an option in the resulting popup menu to create a Genius Playlist. That is now gone. Is it still possible to create a Genius Playlist based on a song, and if so, how? iTunes seems to be Apple’s only app with schizophrenic contextual menus. There are two contextual menus available when you select an item in iTunes. One of them displays when you click the “...” button; that’s technically a popover. And the other shows up when you right-click an item; that’s a contextual menu. The menu item you’re looking for is still there, just not in the menu you clicked. 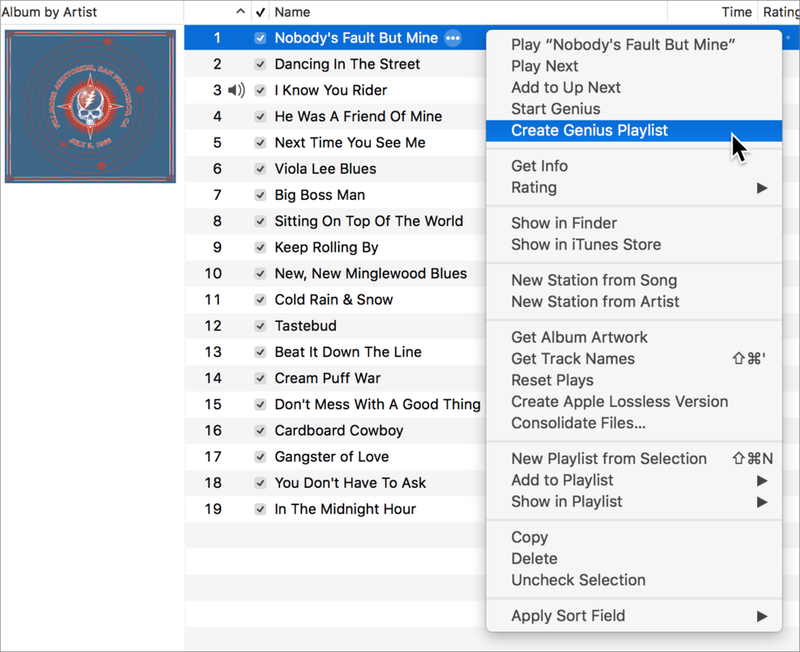 Right-click any track, and you’ll have the option to create a Genius playlist from the contextual menu. Create a Genius playlist from a track by right-clicking a song and choosing Create Genius Playlist. 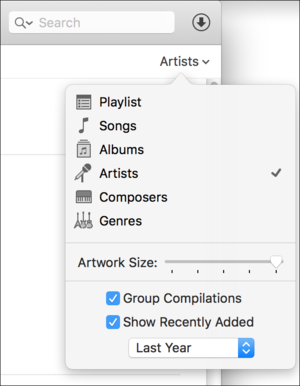 However, it’s possible that there are no matches for a given song; if that’s the case, iTunes will display a dialog telling you so. Q: I have several hundred CDs that I’d like to use digitally without having to actually rip them. Does iTunes Match or some other service give me the ability to stick the CD in, have its ID read, and then match it to an online copy I can stream, without my actually ripping the CD? Alas, no. It would be too easy for someone to bring a record collection to a friend’s house and have them insert all the CDs to get them to match. Sure, it’s a lot of work to rip hundreds of CDs, but at least we can still do that. You can split compilations in Artist view by unchecking Group Compilations. Q: I created a “Piano” playlist, and it contains 116 albums, 780 songs. Most of them are in the correct alphabetical order by artist, but the first two albums are not in alphabetical order. They are listed as “Various Artists,” which should be under the letter V, not before the letter A. I have tried deleting and retyping the information in case there is some hidden information I can’t see but it changes nothing. Why is this happening? When you set an album as a compilation, then iTunes displays it as Various Artists. 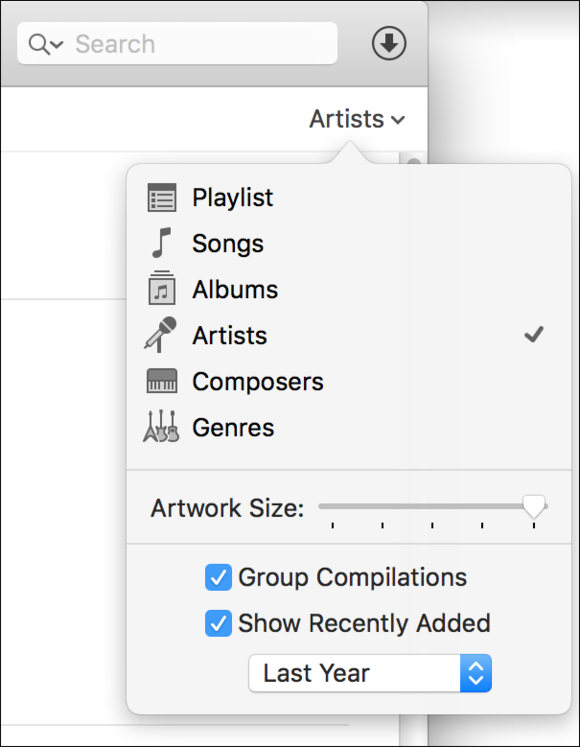 You can still see the artists on their own if you’re in Artists view, and you uncheck Group Compilations in the View Options popover. The whole idea of compilations can be a bit confusing; I wrote an article about this topic several years ago. The screenshots show an older version of iTunes, but the concepts are still the same. Q: I’ve long had a smart playlist in my iTunes library that sorts all my purchased content: music, movies, TV shows, etc. It does so by finding the word Purchased in the file’s kind. But since iTunes 12.3, this playlist shows a lot of music that I’d ripped from CD. And if I check the tracks in the Info dialog, they show as Purchased. Any idea why this is happening? 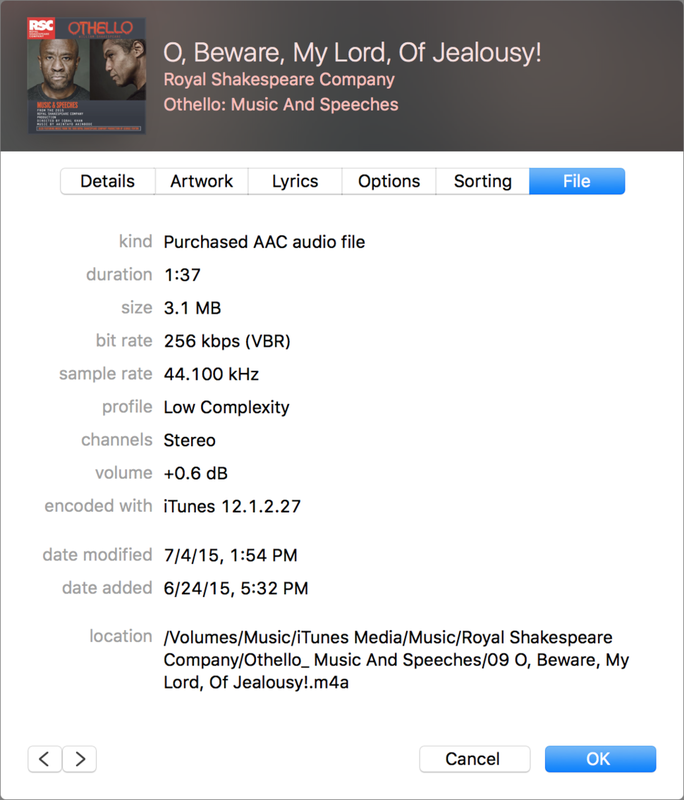 In spite of what iTunes says, this is not a Purchased AAC File. The above file is one that I ripped from a CD; it even says so, in the Encoded with section. I looked at the file’s data, and I looked in the iTunes Library.xml file, which records the metadata that you see in iTunes.